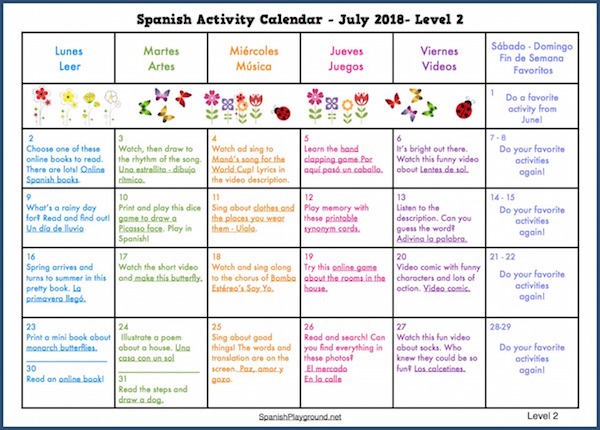 Summer Spanish 2018 was a great success! 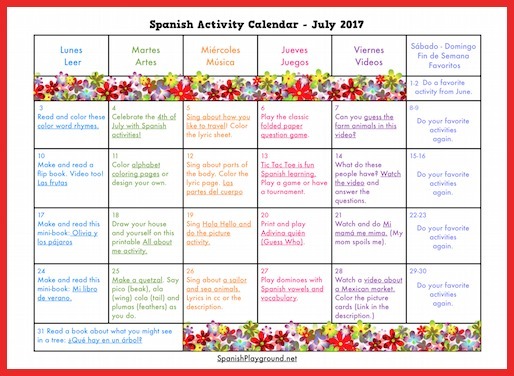 Again, thousands of kids read in Spanish, completed play and reading challenges and kept up their language skills during the summer. Of course, you can use these summer reading program resources all year long. 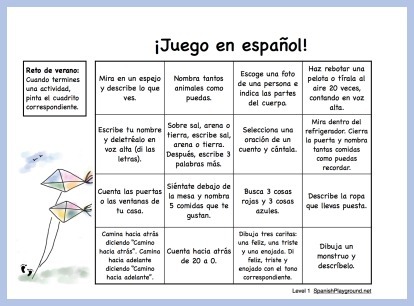 Keep reading and playing in Spanish, and join us again in the summer of 2019. 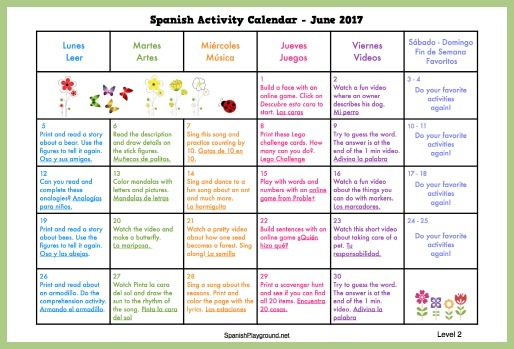 Here you will find printable materials logs, challenges, activity calendars and certificates. 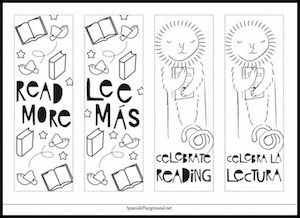 New summer reading program resources are added throughout the summer months. If you haven’t registered, sign up now. 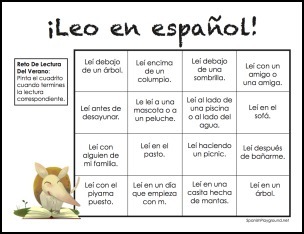 It’s free, and you will be entered to win great Spanish prizes in grab bag giveaways all summer long and our end-of-summer giveaway. Are you wondering what to read? 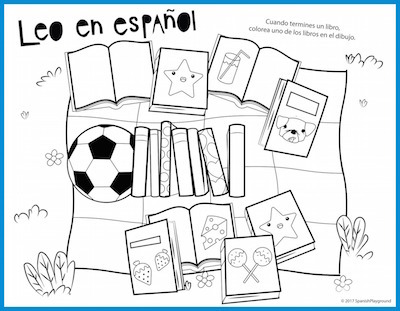 Visit these two pages to explore a wide variety of Spanish reading for kids. 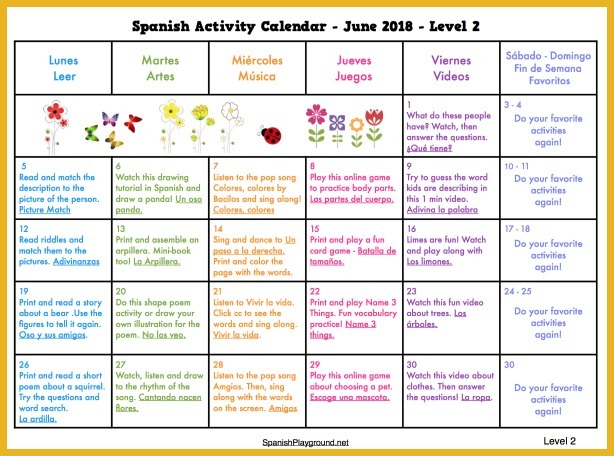 Spanish Reading Resources for Kids – This is where you will find printable and online stories, activities for picture books, printable reading practice, book reviews and support for parents and teachers. Questions? 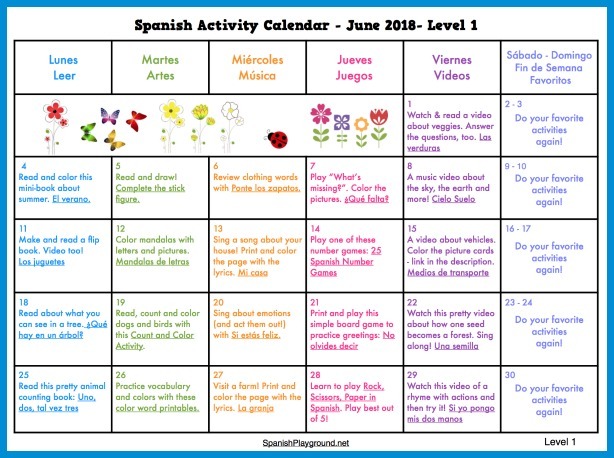 Check out the Summer Spanish Read and Play FAQ page or contact us using the tab in the top menu. We’re happy to help! 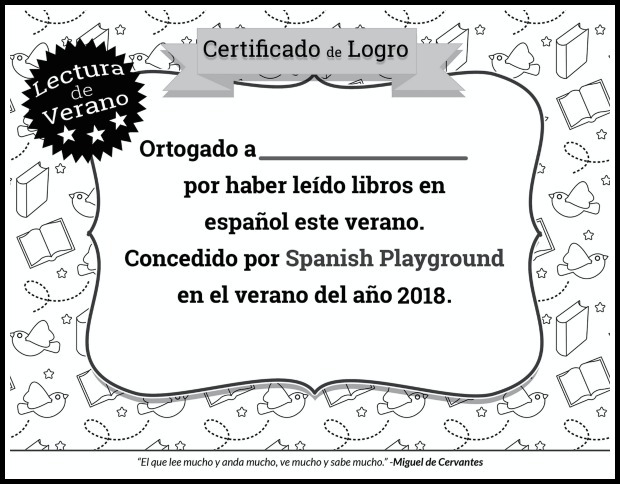 A certificate to recognize the effort kids put into reading in Spanish. Taking and talking about photos kids develop language skills! 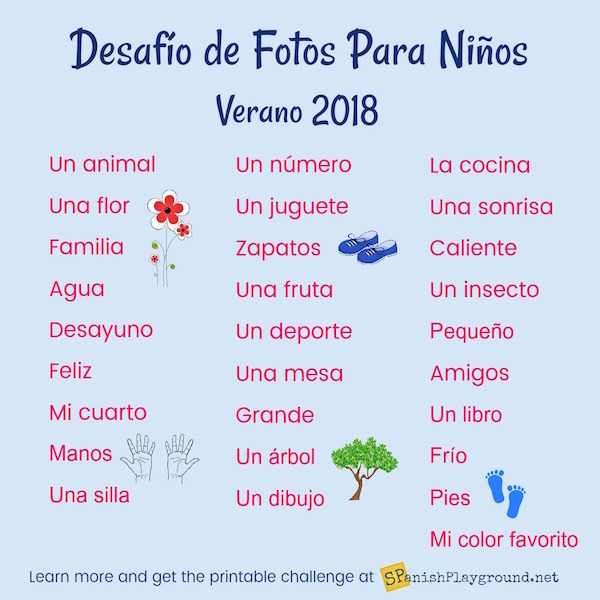 There are suggestions for using the challenge and printable version in the post Spanish Photo Challenge, or click on the image. 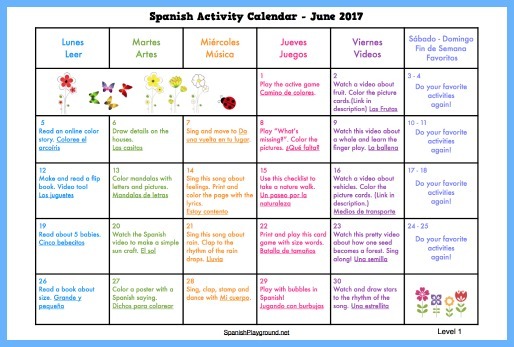 Summer activity calendars divide Spanish learning into manageable bits that fit busy schedules. The interactive links go to a variety of learning materials. First, download the PDF of the calendar. 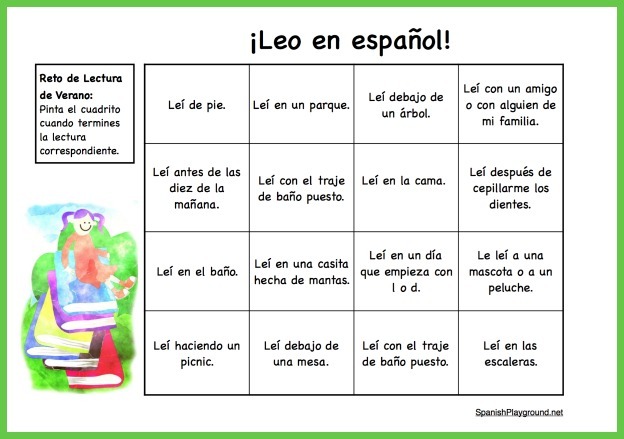 Then you can click through to Spanish games, songs, videos and printable activities. 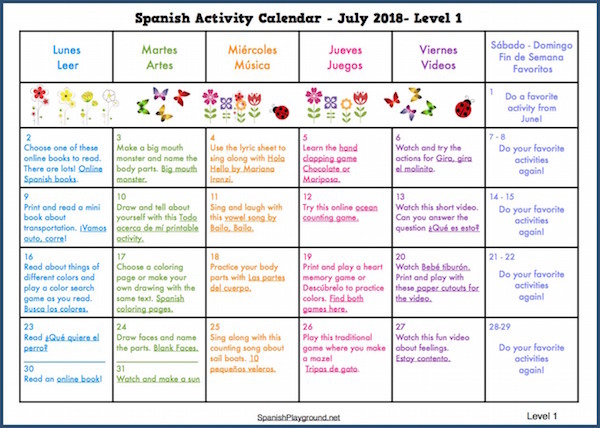 There are two calendars for June and July 2018 with different levels of activities, so you can mix and match ideas that are most appropriate for your family or students. Click on the images for the PDFs. 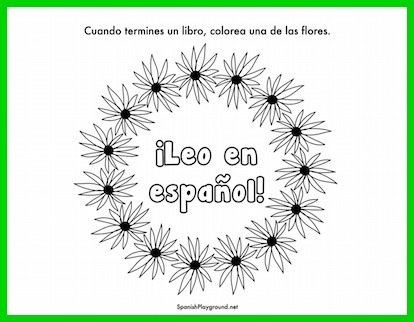 When you read a book in Spanish, color part of the log. 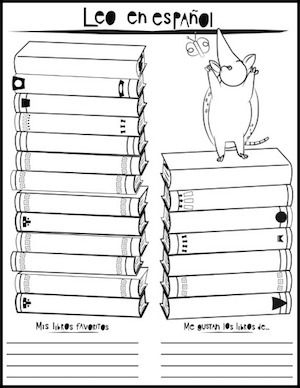 When all the picture is all colored, print a new log and keep reading! Our log for Summer 2018, leaves room for your child to draw herself, other people or whatever she likes into the picture. Who or what is on the couch with the bear? 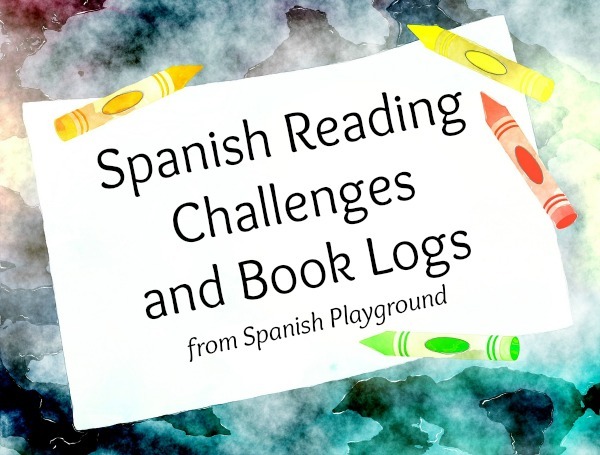 Scroll down for more logs, as well as reading and play challenges. With this log, kids can write in titles and keep track of favorite books. 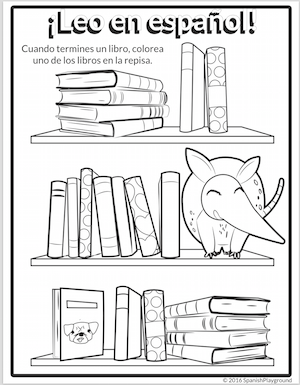 Printable Spanish Bookmarks– These bookmarks celebrate reading and encourage kids to read more. 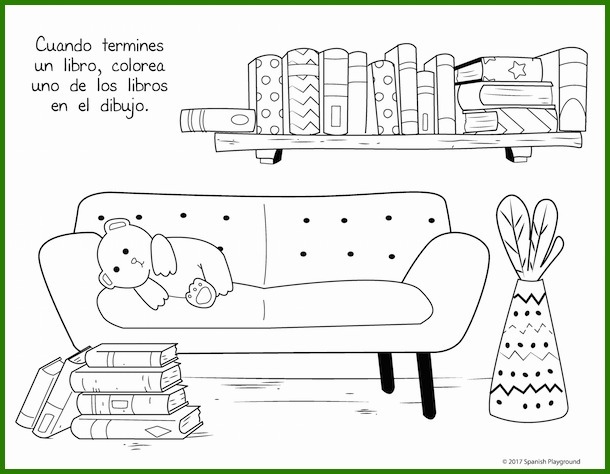 They are black and white so kids can add their own color, decorations and style. 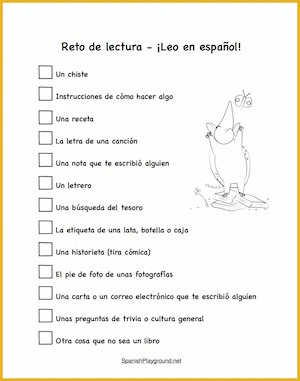 The Spanish gratitude journals ask children to think about the book they have read and identify something they like in the story or illustrations that they also have in their own lives. 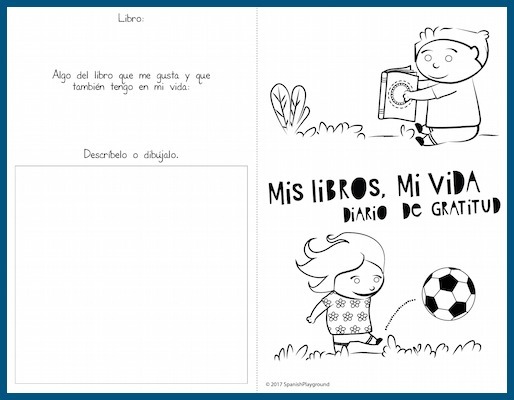 In addition to encouraging children to reflect on positive things in their lives, this Spanish gratitude journal reinforces relevant vocabulary. Find more information and the complete downloads. 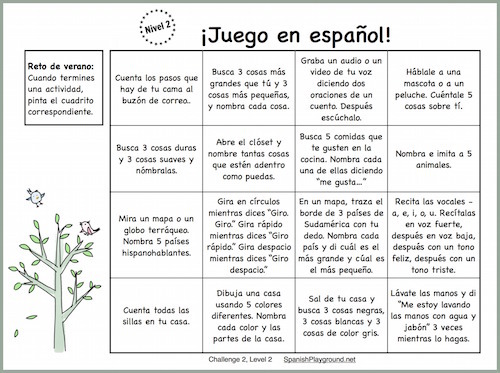 A printable challenge and resources for finding comics, recipes, signs, photo captions and more.